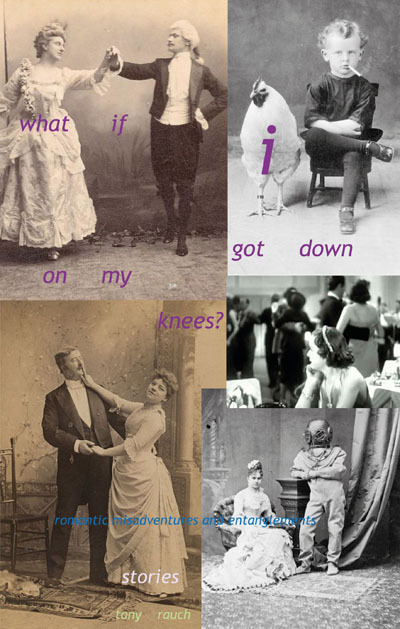 What if I got down on my knees? is a collection of his own work that explores the human heart, its loves and losses, and the comedies and dramas that ensue. Not stinting his category’s vast and flexible potential, these are relationships of all kinds. Rauch turns over romance, friendship, loyalty, betrayal, and the familial ties that bind. Under it all, after all the dust settles and the big babies of confession float and sink with man’s truths and lies, there lies Rauch’s tenderest proposition: the fundamental need in all of us for human contact. Most surreal of all is Rauch’s unwavering use of the first person. Of course, this is not new, but I have not read in the voice of the protagonist such raw and honest thinking before. I could be horribly ill-informed, however it strikes me that to be so completely in another’s mind is surreal. Rauch makes us believe that we are seeing everything; warts and all, of a situation. ‘Here it is, this is the emotion and situation that goes with it—now what do you see?’ Throughout is this question; what do you see? We will all see something different, but you will see… As a collection, these are tales from different times and places in the author’s creative life, yet it holds together in a cohesive whole; Rauch has returned many times to similar themes. His re-examination adds to the feast, rather than detracting or breaking away from it. Although some stories sit more comfortably together, Rauch throws in a few of his more obviously metaphorically surreal tales to loosen it up. A very recognisable sense of regret, lost opportunities and the bittersweet pull of remembrance figures in some of his most romantic stories. The expression of male protagonists in ‘when Jesus and I played football,’ ‘I used to know her,’ ‘the new neighbours,’ ‘the knockout’ and ‘in the sun’ is one of lucid, forgiving clarity. It is an enviable state of calmness, a Zen acceptance. In retelling the past, these are characters that can live with its fading barbs, to forgive a younger, more confused self. This is story as catharsis, and not just for those who have loved and lost (or never quite won) within the narrative, but pulling on a resonant chord within anyone who has ever lived around other human beings and struggled in their formative years to impress. In other words, pretty much any teenager who has ever lived. The magical, terrifying stage of life that is adolescence is one of Rauch’s favourite tropes. It is in this state of not yet cynical adult, not anymore the amazed child, that he finds the playground of human emotion at its most powerful. His stories of loss and change (‘idiot’s guide…’ and ‘riding the range with the cowboy spies’ in particular) in the lives of young men facing upheaval (respectively; a gang member watches his friends part ways and move on into their adult lives and a new college student returns home to his more parochial roots to find he no longer fits in) are told with an epic tenderness and an emotional clarity I for one cannot recall from my teenage years! With author as god-like eye watching over his charges, Rauch’s authorial intent focuses on inner life of turbulent and terrifying emotional landscapes. Rauch helps his young men find their voices; and what they say, while pulled into a poetically ordered form, cuts close to both heart and bone. Circular arguments with the self in attempting to find a way through, to convince the self of a course of action, to justify a way of thinking and feeling, all of this brought out and laid down in excruciating honesty. We feel for these young men—feel for them as young humans. This is not a place for combative gender politics. Then there are the familial bonds. Broken by betrayal (‘my father’s secret’), changed by circumstance (‘wooden horses’) and created anew in the unwitting (‘congratulations’). Rauch writes on the familial less than he does the romantic, but there is romance in families, too. Families can help and hurt, can nurture and expel. The responsibility of being the loved one can be overwhelming. A new child, whilst delivered in a highly unconventional manner to the male (yes, male) protagonist in ‘congratulations,’ is still a new life, with all the stomach-dropping amazement that such responsibility now incurs. ‘Wooden horses’ is told, unusually, in second person—a thought experiment that requires a certain distancing of the subject. This young couple seem pretty au fait with their selves: smart, clever, hard working, shabby-chic. But while he is following the path of conventional career and making allowance for the eccentric in their neighbourhood, she is drawn towards that off-centre, artistic expressionism. Her wooden horses were toys that remind her of the beauty of not owning the world, of “waiting to be reborn.” The solid and the ephemeral; a relationship of opposites that works, yet is not the bound-entire of old-fashioned romance. The romance of allowing the Other. It is a bold suggestion. But when there is betrayal—to the family (a boy learns about his bigamous father’s second family), or to friends (a slower-minded compadre is left to take the heat in ‘in the dust’), then forgiveness can be slow, if ever, to arrive. Those we love will hurt us the deepest, and Rauch reminds us how love can be the cruellest tie of all for that very reason. A bullied loner at school, betrayed by his peers into a childhood of shame and tears, wreaks an awful series of fatal revenges in adulthood against those who hurt him the most (‘hooray for all the children’). Even the narrator, who simply ignored him, wakes up to find his entire house rendered petrified: a metaphor, one cannot help thinking, for the state of the loner’s emotions because his peers did not step up and support him when he needed it most. The need to belong, betrayed. Life itself betrays a man into a lonely death in ‘how I hope to die.’ Left to pass away in a record shop, the narrator (the shop clerk) muses on this, and the transitory nature of social bonds, deciding that if to die alone means to become a legend in a record shop (“see where the dude died—sit where he sat!”), with the wonder and awe that a legend entails, then alone is not so alone, but a shrine of sorts to the unknown lover of good music, the hipster’s lone soldier. It’s not all gloom and doom. Rauch has a keen eye for humour, and ‘let’s get sad’ warmly lampoons the gothic emo: the desire to connect rendering a need to be ‘cool’ and mysteriously morbid. ‘Lesser gods’ features the date from hell—a slapstick parody of action films and rom-coms. As our poor hero goes from bad to worse in attempting to impress his date with the best night of her life, his striving for such perfection is utterly deflated when she turns out not to be the sparkling heroine of his hopes, but a selfish, shallow, bigot. Horror of horrors! No Nora Ephron happy ending, this. Instead, our hero stands beside his hired carriage driver as they burn the remains of the ill-fated thing, taking a companionable drink from a flask. As he gazes into the night sky, he finally comprehends what the music shop clerk, the bullied child, the artistically inclined wife, the futuristic protagonist having ‘modern problems’, the wondrous fairy-watching voice in ‘althea (moonlight)’ and the TV-drama-hinted lady in ‘shiny things’ all sense or out and out realise. That what we crave, what we all need, is recognition. And recognition is the start of connection, and connection is love. The many variants of love are connections by many, many different names. in this simple little world, that all anybody seemed to ever want […] all of us connected, entangled even, in this strange time that never ends, all the complicated, exhausting goo we go through, all the fragile connections, all the frayed ends, all the tatters and tangles we have to mend, and even in all of that, that’s it’s still so tragically simple that all we ever seem to want is someone to tell us that we’re not alone, that we’re okay, that we matter, that we’re important, that we’re not an ugly mutt-puddle ’lone in a forgotten corner, that everything’s going to be all right. That is what I saw. Hell, it’s what I’m going to see: from an author who writes to be seen as a reviewer who writes to get noticed! A challenging and ultimately satisfying author, he sends you curve balls of humour and nonsense just when you think he’s playing the absolute straight man. This is a book of stories that will chime with lovers of all types of genre; there is not a total specificity to it being corner-shelved as ‘speculative’, and as Pratchett said, it’s a way to work up those mental (and in this case, add: emotional) muscles. I had to dip in and out several times, but for a short story collection that is entirely appropriate. What I found most challenging was that it made me carry on. Occasionally it pricked at a carefully nurtured angst I had filed away from younger days as a ‘Truth’, and thank goodness it did, or else I would not have had the release and pleasure of a well-timed narrative. It is neither wishy-washy, nor is it coldly self-aggrandising. It is tender, it is true, and it is wonderfully odd-ball. Above all, it is humane. I've recently discovered your blog but I think I will be a regular visitor. From the comments you make in your reviews, it looks like your taste are really similar to my own and you look for the same things in good storytelling. Anyway, see you around the blog. I look forward to reading more and trying some of the fiction you recommend here.